As my search for the best flight deals to destinations around the world continues, misleading fare alerts and stale fares have become so common that I can see why people have become skeptical about paying for fare alert subscriptions. Who has the time or money to waste? This is why I only trust a handful of deal websites to send me fare alerts daily. Whiskr is the newest addition to that list. 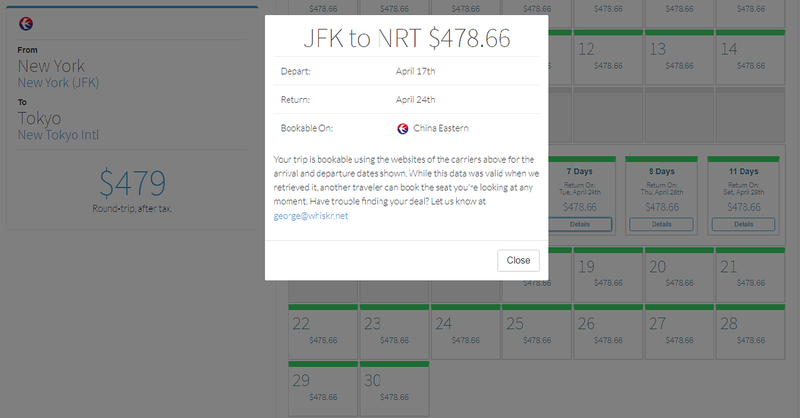 Whiskr is a flight deal website that uses big data to find and track mistake fares and short-lived flash sales. While other travel sites get their information from sources second-hand, since Whiskr has been collecting fare trend data for years, their exclusive database compares current fares to over 264 million historical fares in-house. Whiskr’s “FlightBot” then scans for price anomalies and instantly alerts you via email or text message. Whiskr originally started as Flight Fishing, a simple online mailing list. 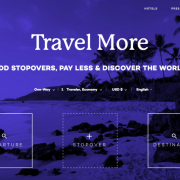 Founded by Chief Travelers George and Jamie Haskell in 2012, Flight Fishing helped travelers shift through the clutter of monitoring newsletters and travel sites for fare sales. Back then, Haskell spent hours manually searching for mistake fares and cheap fares on forums, blogs, airfare sites and even social media platforms like Twitter. However as they began to automate the process, Flight Fishing grew. Haskell eventually started a new venture and founded Whiskr in 2016. Whiskr automatically posts 300-500 active flight deals at any given time and routinely checks that listed fares are up-to-date. This means that on average, Whiskr’s deals are 3 to 5 hours more accurate which significantly increases your chances of getting an amazing deal. 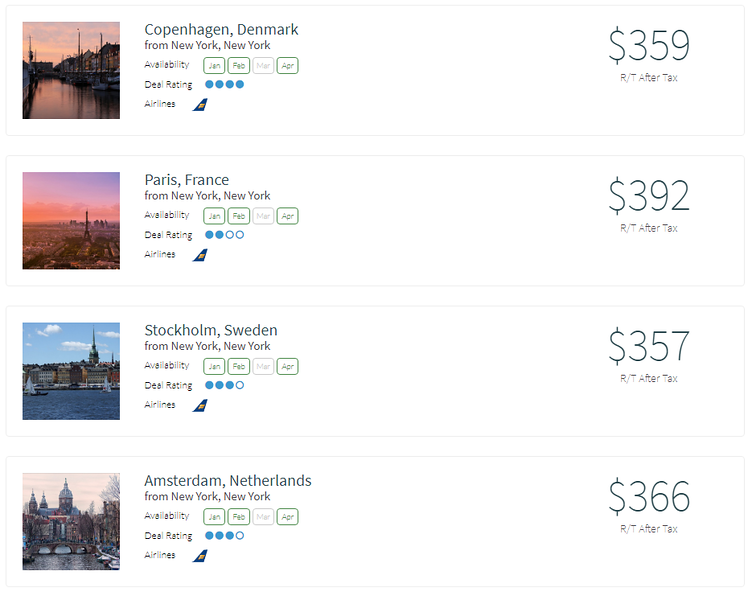 If searching for outdated fare deals is one of your biggest frustrations (like it is mine) Whiskr aims to limit this as much as possible. As an interesting side note, in Whiskr’s five-day free “Cheap Flight Crash Course”, you’ll learn how to find low fares and the bait-and-switch industry practice of “caching”. Since gathering and sharing real-time flight information is expensive, instead of showing new search results, travel companies (like Kayak and Skyscanner) “cache” the data from earlier searches. So when you’re searching for that “incredible” deal and the price changes, this deal was likely sold out hours, days or even weeks ago. Enter the airports that you’d be willing to travel from. Type in the airport shortcode or city. You can always change this later. 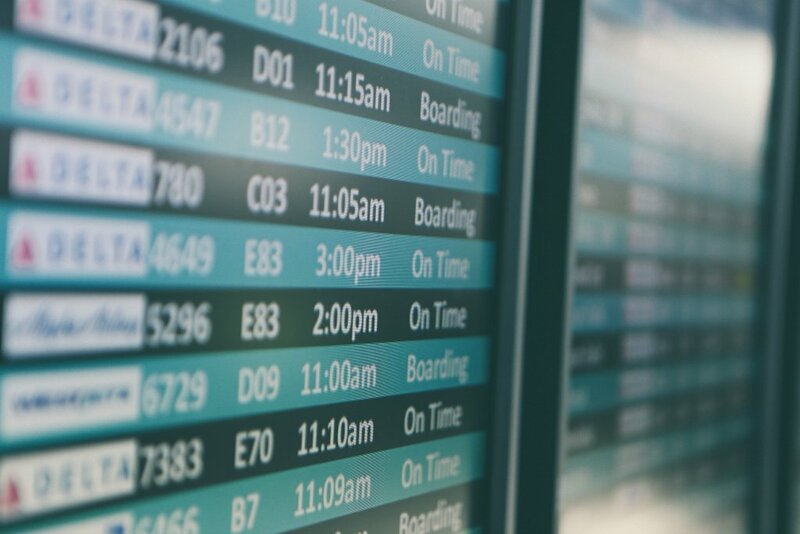 Helpful Tip: Select three or more airports to get frequent alerts. Whiskr will even suggest some nearby smaller airports to help you find the best fares. Note that you can only choose airports departing from the U.S.
Set the regions you’re interested in traveling to. 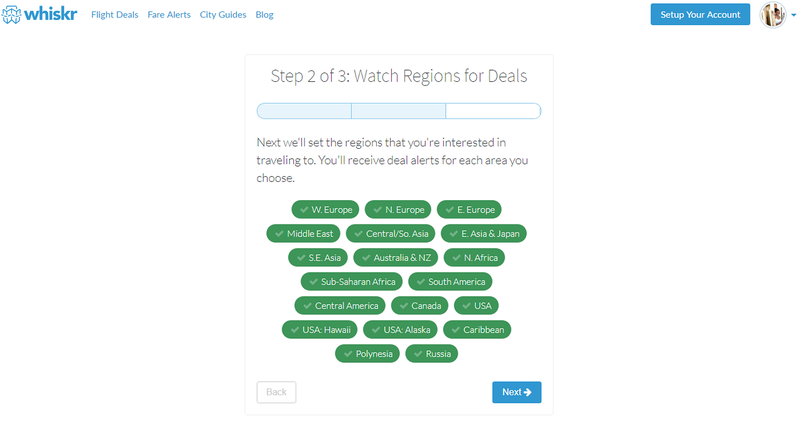 You’ll get deal alerts from regions like Western Europe, Northern Europe, North Africa, South East Asia and more. Helpful Tip #2: To get more deals, set alerts to “instantly”. The other day, I got 15 email notifications of flight deals departing from New York City. All emails were sent from “George from Whiskr”. This is something that I haven’t seen before with other flight deal alert services! Here you can choose weekly, daily, periodic or as necessary deals for flights to India, China and even airline alliances like Star Alliance or Oneworld. Once you’ve found a deal that catches your eye, use Whiskr’s monthly availability calendar to search for flights. The cheapest dates are conveniently highlighted in green. If you’re having any trouble with your search, send Whiskr an email. The only negative that I’ve found is that Whiskr does not allow you to book flights with airlines directly. I get it though, Whiskr is a fare alerting service. They are objective with giving us the facts. Although each deal directs you to the site where you can book your trip, just know that you’ll have to go on to make reservations in a different tab. Lastly, let’s talk about pricing. Whiskr offers three plans all of which offer the same service; the only difference is price and length of subscription. The monthly subscription costs $4.99 USD while the quarterly and annual plans cost $12.99 USD and $39.99 USD. 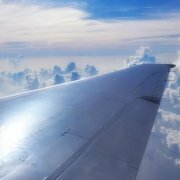 The greatest value that I’ve found in paying for a subscription like Whiskr is that you can potentially save hundreds of dollars on flights. On average, people save 46% using Whiskr. For the most savings, get the annual plan which will save you a total of $19.89 USD or 33% compared to the monthly subscription. However, if you aren’t ready to part ways with that much cash, try Whiskr free (no credit card required) for 14 days to see if it’s the right fit for you. Or enter the giveaway below! I’ve teamed up with Whiskr to give two lucky readers annual subscriptions (valued at $39.99 USD each). No purchase required, giveaway ends Monday, December 25, 2017, at midnight EST. Mandatory: One entry for commenting below: What flights are you searching for right now? Optional: Get two more entries for liking The Thought Card Facebook page. This post is in collaboration with Whiskr, of course, all opinions are my own. Searching for flights for Honduras and Dominican Republic! ??? I’m just now getting into to error fares. I know I’m late! I was so excited when I booked round trip flights to Ft. Lauderdale for $75 last year. After that error fare, I’ve semi stalking flights. It would definitely be great to win this subscription. Hi Terri, no worries! I’m just glad that you’re getting incredible fares to travel with your family. $75 for round-trip to Ft. Lauderdale is a great find, keep it up!